This morning I woke up with the sunrise between my toes. Little chirping birds – bou bou’s, babblers, and white-browed robin chats – were happily hopping on the branches near my bedside. A fish eagle called and was greeted by its mate as hippos returned to the water with great clumsy splashes after a night of feasting. In fact, I was sure I could hear one right beneath my tree house! I could probably take a few steps out of bed and say good morning to it, but bed was way to comfortable! Besides, there’s no rushing at Ngepi, just the peace and perfect rhythm of Mother Nature. 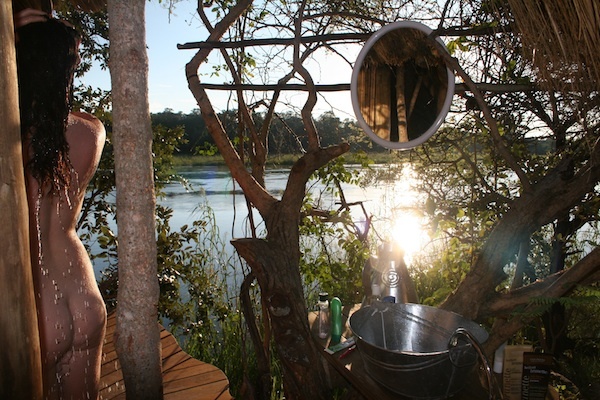 Bedtime in an Ngepi tree house is equally special. Last night I showered beneath a million bright stars, naked for only the hippos to see. It’s the very definition of being alive and free. 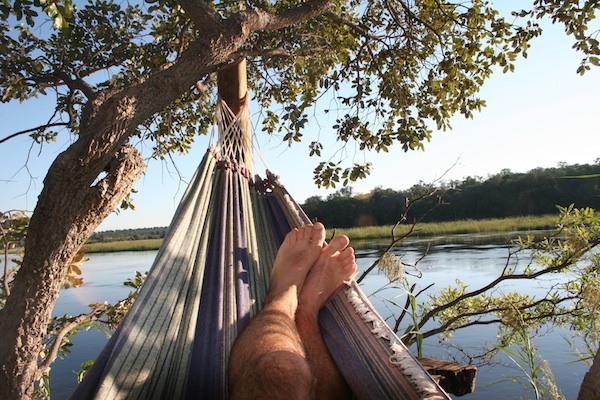 Alive to dream new dreams and reflect on another spectacular day in Africa. I listened with delight to the low hoots of a Pels Fishing owl, which echoed into the evening and eventually sent me soundly to sleep. 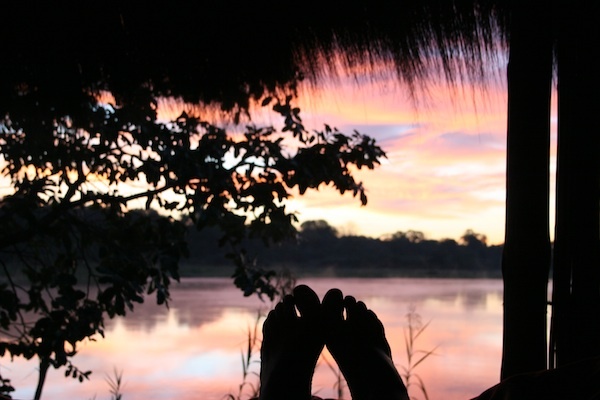 On some nights you may even hear the roar of a lion from the other side of the river, which is Bwabwata National Park, or from Mahango Park to the South. 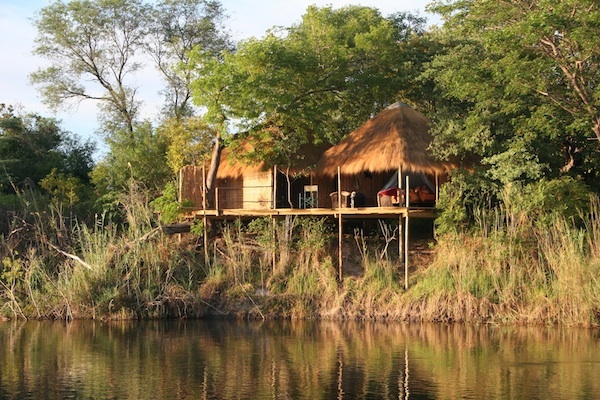 Ngepi has twelve tree houses in total, each one unique and completely open to the river. They are all built of farmed materials upholding our strong belief in the importance of safeguarding the area’s indigenous trees. Even the trees that our houses are built around have not been touched or used as building structures, symbolising that man and nature can live together peacefully. At Ngepi, everything (including hot showers) is run on solar energy. Mark Adcock, Ngepi’s founder, owner and ‘artist’, has made sure that solar panels are not hidden by vegetation, but placed in full view for guests to see, “I want people to ask questions, I want them to say this works so well, where can I get one?”. More than a camp, Ngepi is a place of learning. Every element reflects a commitment to live sustainably, to reduce human impact on the environment, and, as a foreign client once put it, “live with your feet in nature!”. Another environmentally friendly novelty is the tree houses’ air-conditioning system. It’s a method so simple yet so clever! 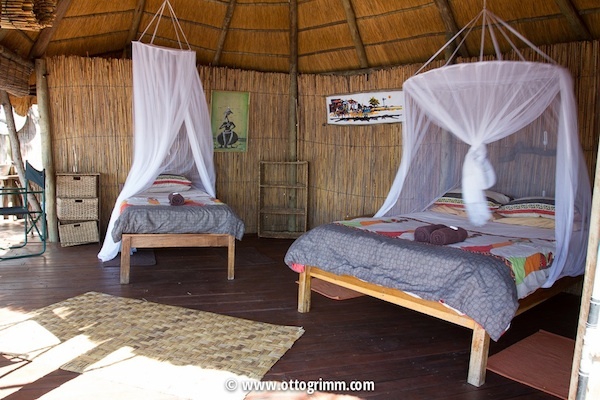 At the top of each thatched roof is a tap, and, when it’s switched on the cool water runs down each side of the roof. Air blowing against the water is cooled (the same as when we sweat) and this causes the temperature of the room to drop by at least 10 degrees c.